MWM NEWS BLOG: Caleb Neelon's Book Of Awesome. Caleb Neelon's Book Of Awesome. Just got an awesome pack in the mail from Caleb Neelon. A signed copy of his new book and a grip of stickers from international graffiti legends. Psyched! I met Caleb a few weeks ago in Boston at C&P. Immediately afterwards I mailed him a bunch of my recent books and prints (as I always do when I meet people I look up to). He reciprocated in a major way. This book is truly Awesome. "Murals, Gallery Installations & Street Paintings from All Over The Place". Big UP bro. Keep up the great work! 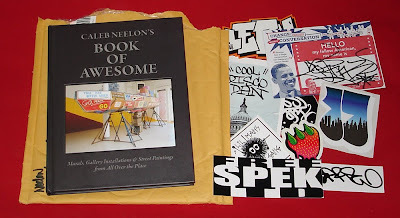 Caleb Neelon's Book of Awesome.